Located in the suburbs of Fort Worth, Texas, the Lochwood Court offers beautiful, residential housing with landscaped lawns and spacious living areas. However, when replacing a water main and storm sewer system located between houses, the spacing can be quite tight and determining how best to handle the project with minimal impact is crucial. 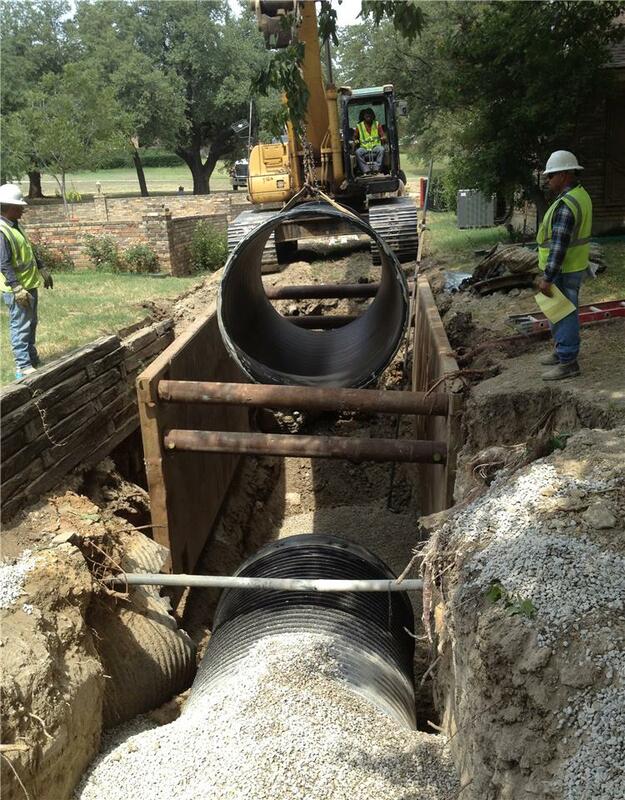 This was certainly no exception when deciding the ideal product to use for a recently awarded project by the City of Fort Worth to replace a storm sewer system in Lochwood Court. Wade Trim, Inc. specified that Contech Engineered Solution's DuroMaxx® steel reinforced polyethylene (SRPE) be used for the project with concrete pipe as an alternate choice. The selection of DuroMaxx was quickly approved by the City of Fort Worth, Texas to complete the project. Not only is DuroMaxx lightweight, but its longer 24' joints allowed for a quicker installation of the required 378 LF. Given these attributes, the pipe could be installed utilizing small equipment providing additional cost-savings. The High Performance (HP) joints also provided a watertight joint capable of up to 15 psi while the unique profile of DuroMaxx would provide the durability of plastic with the strength of steel. Jackson Construction was extremely pleased when the pipe was quickly installed with minimal impact to the surrounding neighborhood. The nearby homeowners were also very pleased as the installation was kept to a very constrained site that avoided wrecking landscaping and encroaching upon surrounding lawns.The project engineer, David Speicher of Wade Trim, Inc. stated, "The product was delivered on time, easy to install, and is functioning as designed. The use of this product expedited our project construction time, and made it much easier to work between two homes. I’d strongly recommend this product for use in similar areas."